continental U.S. for the American bombers & their crews on the long and dangerous flight to England. The route of this flight took them from Presque Isle, to Newfoundland, to Iceland and then to England. 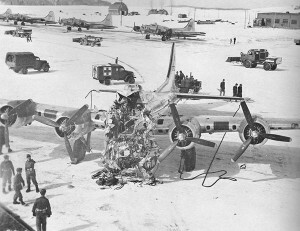 On March 11, 1944 this B-17G went out of control while taxing on the icy runway at Presque Isle. It crashed into the north end of one of the hangars. All of the crew suffered injuries and there was one fatality; Co-Pilot Second Lieutenant Thomas Walker from Stockport, Ohio died in the crash.